Increased emission standards mean replacing an engine now requires approval from air quality regulators. Each new tier of diesel exhaust technology provides fewer emissions and regulatory agencies want to prevent “backsliding” on emission levels. 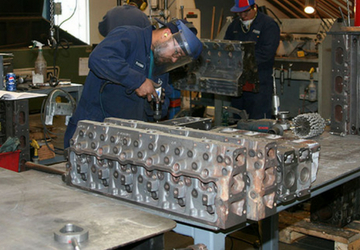 Several states have enacted laws that prohibit an older tier engine from being put in a machine that left the factory with a newer tier rating. In California and many larger cities with air pollution concerns, regulatory boards may not allow for a same-tier swap when replacing an engine. The California Air Regulatory Board (CARB), for example, doesn’t look at individual machines, but instead at the total fleet emissions output. CARB may decide that a contractor in California could swap a few machines with like engines if they have equipment that is primarily powered by Tier 4 Interim or Final engines. A fleet made up primarily with older machines might require a contractor to use higher tier engines or to replace machinery with new equipment to meet a lower total emission output goal. No matter where your fleet is located, it’s good to check your local restrictions before deciding to repower or replace machinery. Replacing a Tier 1 or 2 engine with a Tier 3 isn’t difficult because the designs of those engines changed little between tiers. Making a shift to Tier 3 may earn some emission credits in California and elsewhere. Unfortunately, it’s more difficult to use a Tier 4 Interim or Final engine in most machines originally powered by engines from Tier 3 or earlier. That is because the aftertreatment of Tier 4 engines has significantly altered the architecture and electrical integration of the equipment, including large diesel particulate filter (or DPFs) canisters that take the place of the muffler. Smaller Tier 4 Interim and final engines that are below 75 HP have been able to avoid using a DPF, but contain a somewhat smaller component – the diesel oxidation catalyst (DOC). The DOC is a similar filtration system that still takes up more space than previous engines required. Cooling systems for Tier 4 can also be up to 30 percent larger than the previous engine. The selective catalytic reduction system (SCR) is an additional layer of emission systems in Tier 4 engines. The SCR injects exhaust streams with a mist of diesel exhaust fluid (DEF) and water before running emissions through a catalyst. This transforms nitrogen oxide, which is a harmful pollutant, into harmless water and nitrogen. This system requires storage tanks for the DEF and related equipment. Another complication is the increased sophistication of electrical systems that help provide more operational efficiency. Higher tier machines use an electronic control module (ECM), which is a computer that works with equipment sensors to adjust for maximum emission reduction. Putting an ECM in an older tier machine may require an almost impossible amount of re-engineering and shifting of electronic components to make space for the ECM. But stationary equipment, such as large trash pumps, light towers and gensets, the engine is often mounted on a skid or platform, don’t generally have the same space restrictions. Engines in these applications tend to run at a steady RPM and don’t have to rev up or down in response to loads. This functionality means engines in this use don’t require sophisticated ECM units, making the engines easier to upgrade to Tier 4. Generally, bigger machines tend to be better candidates for repowers. Compact units often are too worn to justify the expense of updating the engine. The most cost-effective machinery for repower tends to be scrapers, motor graders, off-highway trucks, track-type tractors and wheel loaders. For these types of machinery, a repower tends to be less than 15 percent of the cost of a new replacement machine. The decision to repower older equipment takes in numerous factors to meet local regulations. You need room to fit the additional equipment required for a Tier 4 upgrade. New equipment might make more sense if it provides a lower total cost of ownership over repowering older equipment. Take into consideration the type of work expected to occur during the next 10 years of the machine, which can help guide decisions for long-term fleet requirements. Consulting with an OEM, its qualified distributor or an independent consultant is always a good idea. These professionals can evaluate the cost and feasibility of whether you’re better off purchasing used equipment that requires an engine replacement, repowering something in your own fleet or buying a new machine. Qualified experts such as ours can help assess and provide the extra engineering required to ensure the solution will be adequate for your equipment and the most cost-effective for your needs.